President-Elect Ed Krishok and Executive Director Mary McCormick attended the annual Rotary Large Club Conference in Little Rock, Arkansas, January 14-16th. This conference is a once-a-year opportunity for Executive Directors to meet with peers to share ideas, and it gives Presidents-Elects an opportunity to discuss plans and goals for their year as President. It is also an opportunity to experience another large club’s weekly meeting; there is time for in depth conversations and building relationships with other Presidents-Elect and executive directors on topics of interest. We can ask questions of other clubs on topics such as how they structure their foundation and community grants. We share ideas for hands-on service opportunities. This year we heard about Rotary International’s new People of Action campaign, reflected on building relationships among board members and committee chairs and strategies to engage members. There are 65 Clubs from across the United States and one club from Canada that attend the conference. In addition to the sessions held during the day, there were social events held in the evenings at the William J. Clinton Presidential Library and Heifer Foundation. 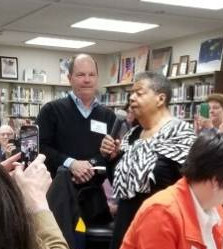 On Martin Luther King Jr. Day, the session was held at Little Rock Central High School which included a brief tour of the school, and Elizabeth Eckford, one of the Little Rock Nine who integrated Little Rock High School in 1957, stopped by our session and shared some of her memories of the events in 1957. Next year’s conference will be held in Long Beach, California.